As a small child, I was often haunted by snakes. I remember running wildly through the rugged terrain near my home in the Los Angeles hills with the raw anticipation of what I might encounter in my daily adventures. In the fraction of a second, though, my childhood glee would be halted and my breath stopped. A snake and I would meet. My spine would tingle in fear and anticipation as to what this mysterious creature would do. Would it see me? Would it strike? Not only was I suspended in fear, but truly hypnotized by its powerful energy. Little did I know that years later, I would come back to my childhood snakes, but this time in the form of yoga, in the great pose Bhujangasana, cobra pose, and that my spine would be awakened once again in wonder. It is no wonder that snakes have had an important role in India for thousands of years. From the magical snake charmer seducing the venomous cobra out of its basket, to the mythical 1,000 headed serpent, Shesha Naga, India has long held serpents to be sacred. The mysterious animals were thought to be relatives to the Naga people, the ancient warrior tribe, which is believed to have dispersed throughout India around the time of the epic Mahabharata. Animal worship has played an important role in India’s national culture for thousands of years. The celebration of the snake, Nag Panchami, is a festival that celebrates the snake, and all it represents: death, rebirth, and immortality. Devotees sprinkle turmeric, vermillion and flowers on snakes to honor their role in nature. Some Hindu gods like Shiva, the god of destruction and transformation, and Vishnu, the god of preservation, are pictured with the cobra enfolded around them. Even Buddha is often represented cradled within the great snake. 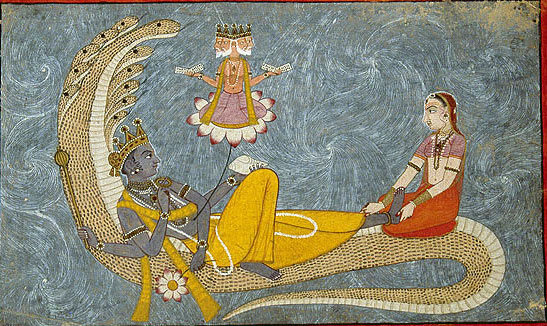 Vishnu is often seen reclining on one of the folds of the great serpent Shesha, who weaves throughout the celestial waters of the Milky Ocean. With the symbolic role that snakes have played in Indian culture, it is no surprise, that Patanjali, the great compiler of the yoga sutras and the forefather of modern yoga, is believed to have been an avatar of Shesha. Kundalini energy is believed to reside in the realm of the great sleeping serpent who is coiled along the base of the spine, and once awakened through devout meditation, slithers up the spine toward the pineal gland and through the crown chakra ultimately moving one into divine Selfhood. Like the snake that sheds its skin over and over again, we too shed our skin, over and over again, each time we come to our yoga practice. In each shedding, an energetic rebirth has the potential to take place. Of course it is important to keep our spines supple and strong like the great serpent. For it is our beloved spine that holds us up and allows us to continue to move throughout life. In elegant Bhujangasana, or cobra pose, we get to know our spine. It is along the lines of the spine that we channel our inner cobra. Cobra not only provides back strength, but also massages our precious digestive organs, stimulating the swadhisthana and manipura chakras. In its full fruition, before it is ready to dance into attack, the cobra raises its great hood, just as we do, as we inhale our hearts forward. The snake also moves between the light of day and the darkness of the underground. Inhaling, we lift our cobra-hoods towards the light (joy); exhaling, we drop our hearts back down towards the earth into darkness (contemplation). Snakes also teach us that we too should we be more in tune with our “gut instincts” as snakes are aware of their surroundings through their bellies as they feel the reverberations of the earth around them. Let our breath then, our mystical snake charmer, seduce the energy of our snake spines to emerge vibrant and alive! And just like the mystical snake charmers who were thought to have strong ties to the gods due to their magical ways with cobras, we too can energetically tap into that divine space that resides along the lines of our beloved spine through the power of the ever graceful and strong Bhujangasana. Teresa Austin is the creator of Myth Asana®, a progressive yoga practice that infuses mythology and symbolism within the beauty and strength of yoga. 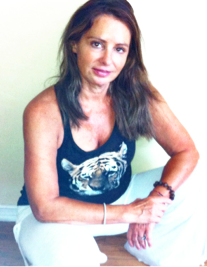 She has been a practitioner of yoga for over 20 years and a teacher for 10 years. Teresa was a world mythology teacher for many years and currently is finishing up her 1000 hour yoga therapy certification specializing in the power of symbolism and storytelling in a therapeutic setting. Her dvd is available at www.mythasana.com.